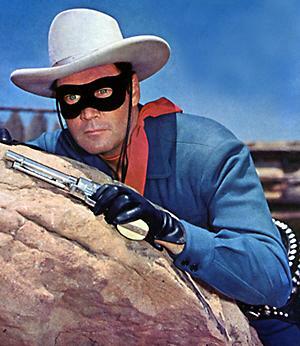 Was the "Lone" Ranger was not really alone? Some of the most widely espoused values in industrialized Western society are those of "independence" and "self-reliance." Pundits continually bang away on these themes and about how people must not ask for, or expect, government help — except as a very last resort. These statements would be understandable if all self-reliance promoters had just swaggered into town wearing a Davy Crockett hat with a freshly killed deer (or bear) slung over their shoulder. 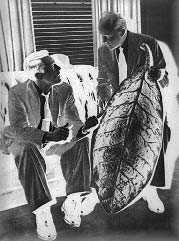 But those who preach self-reliance haven't just rassled up some grub from the back forty. They do not build their own houses with their bare hands. They buy their food in stores; they use bank machines, public sewer systems, public roads, and publicly funded emergency services. Most importantly, they don’t hatch from pods, fully grown. When they were born they were dependent on their mothers (or mother surrogate) to keep them alive. 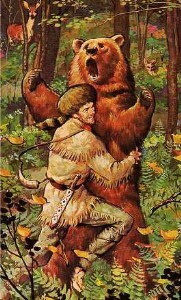 Even Davy Crockett had to wait until he was three before he could kill his own bear. Everyone starts life completely dependent and moves through an endless variety of stages of interdependence throughout their lives. Independence is an entrenched myth because the work that mothers do — upon which all life is dependent — has been rendered economically invisible. Recognizing motherwork as essential and productive would explode both the current economic model and the myth of self-reliance / independence. 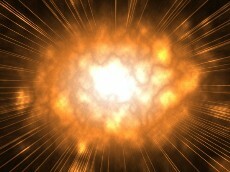 Motherwork is the foundation for all other work, for all economic activity, for all business, for industry, and, to make an understatement, for everything else relating to the human species. However, the independence myth-makers who rail against 'depending' on the government for anything, are just fine with demanding free public service from mothers and others doing unpaid care work. For example, newspapers and other media are dependent on advertisers. In turn, advertisers are dependent on consumers to buy their products. And where do consumers come from? Well first they have to be born. And if we must regard people in purely economic terms, then it is a physical fact that consumers come from mothers. "Until we can produce the labour force we need to remain competitive in the world we'll have to import it" Victoria Times Colonist editorial, Sept. 9, 2003. Thus it should be obvious that industry is totally dependent on 1) women having babies and 2) babies growing up and becoming consumers for their products. Companies spend billions of dollars advertising unnecessary and often harmful products to children. And billions of jobs have a 'dependence' on new generations of consumers for these products. The political left also glorifies the myth of independence and 'productivity'. 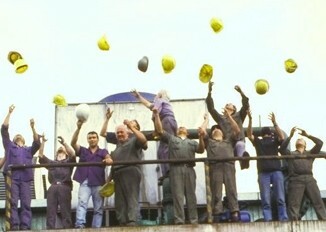 For example the documentary The Take is a paean to traditional industrial working-class productivity complete with a chorus line of rugged auto-parts workers triumphantly throwing their hardhats into the air. Flawed economic assumptions and out-dated mythologies about work perpetuate a drastically unsustainable economic model: the on-going parasitism on the free work of mothers and other unpaid carers; economic impacts from dropping birth rates which may prompt a politically conservative pro-natalist anti-feminist agenda; consumption related health problems; unemployment due to technological change; and escalating social and environmental costs. More recently, futurist James Hughes stated in his 2004 article Embrace the End of Work : "without a clear strategic goal of a humanity freed from work through the gradual expansion of automation and the social wage, all policies short of Luddite bans on new technology will have disappointing and perverse effects… In other words, it's time to make a choice: Luddism, barbarism or a universal basic income guarantee." "The job market is never going back to lifetime employments. Industry-critical work such as free software or Wikipedia is not counted as value at all. However, many people still recoil against the idea of a universal basic income because they think it spits into the wind of their ideal of independence. People fear being labeled 'dependent' so they keep demanding jobs, not incomes, even though as Falkvinge says in his article: "The industrial model is dead and it is not coming back." Because of the delusional death-hold grip that the myth of independence has around humanity's throat, there is mass complicity in allowing our health and our environments to be destroyed in order to keep the status quo creaking rotting weight of the jobs system going. Instead of letting it topple over into a big mess that we will have to crawl out of (if we are able to), we could instead implement a universal income, in some form, in every country in the world. People who insist that this is 'too expensive' and 'unaffordable' somehow cannot see the massively 'expensive' and tragic waste of human and natural resources being squandered propping up a myth based system that does work for anyone. Even the wealthy elite can't have peace as they have to spend all their time plotting how to protect their wealth and power. That sounds like a barrel of laughs. Independence is a myth. Questioning it is a taboo. 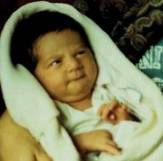 For fun find a BigSuitBigPower person and ask "Who gave birth to you?" 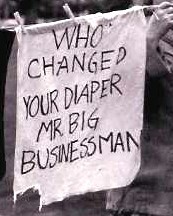 , "Who changed your diaper?" In addition you could ask: why are free market think tanks who rant against government dependence, all government designated registered charities? They talk free market independence while they have their hands out begging for donations. Instead keeping a misplaced focus on "self" sufficiency, a guaranteed livable income would give people the time to create *community* sufficiency and increase people's ability to do the care work that essential to the life and health of society and our future.